This week it's all about fried dough. Okay, okay, for the past two weeks it has been about fried dough - pancakes , phulourie etc. Bakes, floats, muffins, dumplings call them what you will, we in the Caribbean often quibble about whose is better. The argument comes down to this: how can you call that a bake when it is fried? 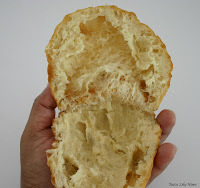 (lol) Read the column to find out which Caribbean country's bake is actually baked and why the name they use to describe theirs, perhaps makes more sense. These are traditional Bajan bakes frying. They are usually flat, some people put baking powder in the dough which then causes them to rise. Guyanese bakes: this is how I roll the dough out before frying it. It's rolled between 3 - 4 inches round. 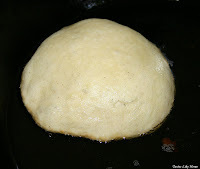 I add the rolled dough to hot oil, it bubbles, swells and then floats. I then turn it over to brown on the other side and drain on a paper towel. This is what it looks like inside when cooked. You can stuff it with anything, sauteed saltfish, eggs, cheese, ham, vegetables etc. Or you can simply spread some butter and let it melt into all the nooks and crannies and eat it just like that! Email me if you need the recipe.